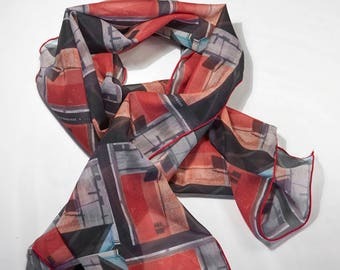 Take a piece of Brooklyn with you wherever you go! 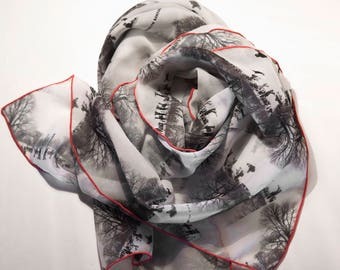 Announcement Brooklyn Bandanas is the artistic creation of Katherine Slingluff. A Brooklyn based artist and photographer. All bandana images are available upon request as a printed archival photograph in custom sizes. Dog Days Bandana, Dog Lovers, Yellow Trim, NYC Dogwalker, Perfect for your Pup, Walking Dogs in NYC ain't easy! My husband and I were born and raised in Brooklyn and have since relocated to San Diego. San Diego is casual so no one wears a tie here. As I dress him for work everyday (come on, all us ladies do it), pocket squares have become the way to make an outfit special. In November, we celebrated the 10th anniversary of our first date so I wanted to commemorate that occasion with a reminder of where we came from. I did a Google search for Brooklyn Bridge pocket squares and came across these graffiti ones. When I contacted the company they were so generous and offered to send me 2 squares for the price of 1 (same square, different border color)..how could I say no? When they arrived, my husband thought they were super cool! He asked me how I found such unique things and I told him. GREAT service, great product...VERY PLEASED CUSTOMER! LOVE this bandana! I wear it around my neck to add some artistic flair to my work outfits. Lots of compliments and people asking where I got it from. Will buy from this shop again! Katherine Slingluff is a photographer living in the Brooklyn, NY area. With an interest in baking, knitting and sewing Tracey created traceytoole designs. A line of aprons, napkins, and other housewares. All made of sustainable natural, fabrics.